That the single-motherhood rate would be an appreciably stronger predictor of ethnic differences when aggregated nationally should not be surprising given the stronger correlations I found at the district level in my prior post, but it’s helpful to get a “10,000 foot view” of the national data to understand the relative magnitude of these differences and how much they are likely to explain. There is measurement and estimation error in the local ACS estimates and some amount of noise and systematic variation in district level school suspensions. There is also something to be said for spill over-effects and central tendencies of groups. Our social norms are informed by our neighbors, our peer groups, our preferred popular culture, and the like and that much of this occurs within major ethnic groups for a variety of reasons. Thus when we do multi-variate regressions on individual or more granular local data these collective influences are likely to go unobserved to some significant degree. The residuals associated with race after controls may be wrongly ascribed to racism or even, to the extent these are truly cultural/social capital differences, heritable differences themselves. That it predicts large differences in non-hispanic white suspension rates between states (in addition to between districts, as I demonstrated earlier) suggests that this probably isn’t well explained by racism or even, for that matter, classism. Also, as I pointed out in my last post, if you extend the white linear regression line between states you end up with a pretty similar prediction for blacks as what we actually observe in their suspension rates. Now, to be clear, it’s certainly possible that these correlations are driven in large part by unobserved endogenous factors. I will not pretend like this question can be settled here. My point here is mainly that this is an excellent predictor at multiple levels of analysis and that it’s not easily explained away as simply being a function of the economic success of the parents, cognitive ability, or the like. For what it’s worth, it’s clear that family structure itself is not entirely heritable and certainly not immutable given relatively rapid changes in family structure over the past few decades. Although there is considerable evidence from twin studies that heritability plays a significant role too (within cohorts, within the US). It is likely that the heritability of family structure has increased in recent years due to increased variance in family structure, reduced moral suasion, increased legal freedoms, increased earnings potential of women, etc (individuals are more free to do what they want, for good or ill, those tendencies being significantly genetically influenced today). Nevertheless, if family structure itself plays some causal role here, the fact that much of the current variance might be mostly explained by genetic factors doesn’t necessarily mean that change in family structure isn’t playing some significant role in society, especially with spill-over effects at a neighborhood level (i.e., living in a community where less than 5% of children live in unstable households may be much different than living in one where more than 70% of them are). There have also been (other) studies that suggest that marriage patterns are quite susceptible to policy changes. 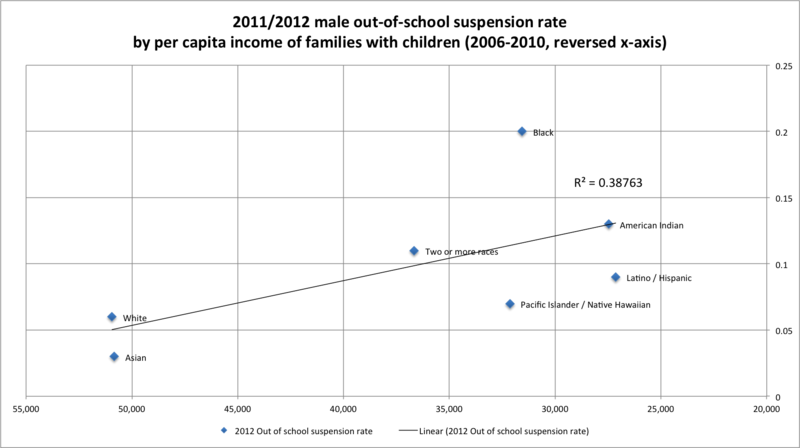 Previous Post - Previous post: On the relationship between school suspensions, race, single-motherhood, and more.